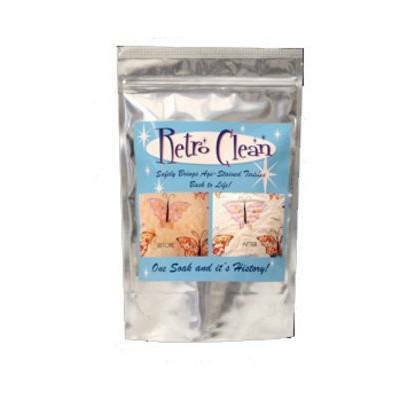 This Retro Clean Soak is an unscented, gentle soaking agent designed to safely remove yellow age stains from wood, mildew, oil, tea, coffee, blood, water damage, and perspiration marks from vintage quilts and all washable fabrics without compromising the integrity of the fabric or color. Retro Clean will renew your treasured heirlooms to their original color and vitality. Comes in 4oz trial size mylar bag.